Launching new project in interactive format enhanced the brand image among visitors! Brief: Lodha Group is a one of India’s premier real estate groups and have developed over 350 million square foot of premium real estate. Some of their landmark constructions have changed the landscape of Mumbai and they are recognized as one of India’s most trusted brand in the real estate category. This group recently held a huge event to launch their swanking new property. Just like the group itself, the display through this interactive medium was to be viewed had to be equally impressive and dramatic. TouchMagix gave them the perfect solution and provided them with a huge 32 inch MagixKiosk™ on which their entire web content was ported in HTML 5. 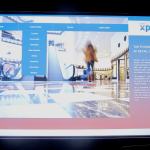 The MagixKiosk™ gave the visitors browsing options so that they could navigate the site easily and also zoom in on required areas. 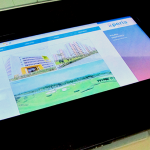 The high quality display gave the visitors the true look and feel of the real estate giant’s projects as could browse the layouts, plans, picture gallery and all other project related information just as they were displayed on the website quite easily through the kiosk. The interactive display generated a great deal of interest amongst the guests and communicated quite clearly the level of excellence that they could expect from them. Impact: Visitors got a chance to view the company website in an interactive format which enhanced the brand image and facilitated deeper discussions. 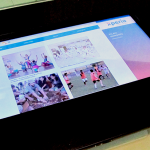 This entry was posted in Corporate and Industrial, Event and Media, MagixKiosk, MagixTouch, Real Estate and tagged interactive, Launch Party, MagixKiosk, MagixKiosk Multi-Touch, Multitouch, Multitouch MagixKiosk, project launch, Real Estate, TouchMagix MagixKiosk on September 29, 2014 by Touchmagix. 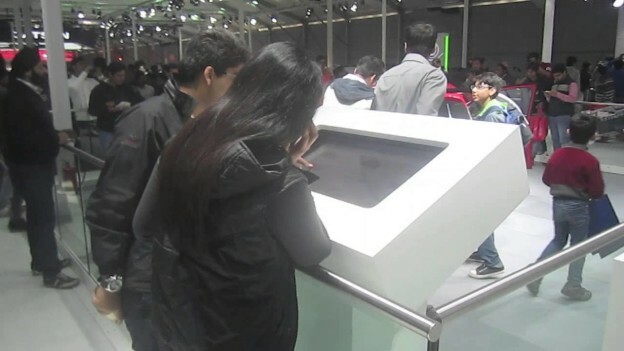 At the Auto Expo, Volkswagen deployed 5 Multi-touch MagixKiosk™’s with custom content. Objective: To provide a fresh, new feel across the display space and the allow the visitors to virtually touch and feel the cars. Brief: The Auto-Expo was a landmark event in the calendar of pretty much every car maker worth the name. Given the large number of high quality brands clamouring for the attention from the visitors, each exhibit had to lay extra emphasis on means to attract and engage them. Volkswagen chose to take the Interactive route towards this goal. 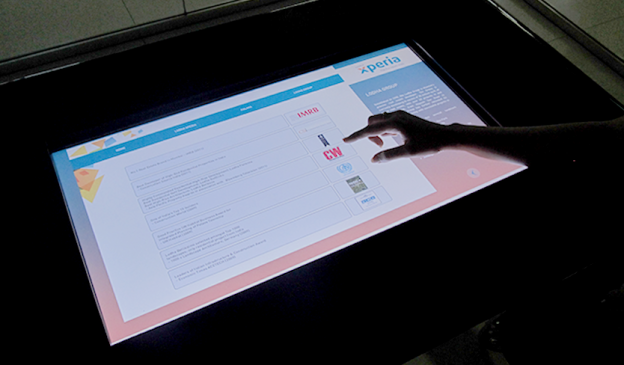 They deployed 5 Multi-touch MagixKiosk™’s across their exhibit. Each kiosk was fitted into a custom developed casing that provided additional messaging and branding space. 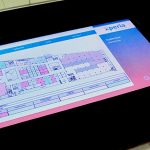 The kiosks were equipped with custom content that contained visuals and simulations along with specs other details of the new models being exhibited. Visitors could view different variants and colours of the newly launched model with a touch or a swipe. They could zoom in or out, rotate the view and capture different perspectives of the car. The inner state was maintained consistent with the model chosen as the visitors viewed the interiors of the car. Once virtually inside they could open doors and windows and also the boot, retract mirrors, adjust handles, open the glove box, turn on and switch off the lights and see the seats as they actually would be in each case in addition to discovering other features of the models. Visitors could also access videos of the high-tech manufacturing plant where the cars were made and also view videos of the testing of the cars. The entire experience was designed to give visitors as close a look and feel of the vehicle as could be given without actually getting in and driving away in it and in the process inform them about the capabilities of the models even as they were entertained. Impact: Even in an event as dazzling as the AutoExpo the Interactive kiosks ensured that visitors left with an indelible impression of the Volkswagen exhibit. This entry was posted in Advertising, Automobile, Consumer and Retail, Corporate and Industrial, Event, Event and Media, MagixTouch and tagged auto expo, AutoExpo India, MagixKiosk, Multi-touch MagixKiosk, TouchMagix MagixKiosk, Volkswagen on May 6, 2014 by Touchmagix.